Weekly Roundup 4-16-15: Cherry Blossoms, MUNI Changes & Bike Share Expansion – Peninsula Moves! Bay Area Bike Share program set to expand: The region’s fledgling bike sharing program—where users can pick up and drop off bikes in stations throughout the Bay Area—could expand significantly in the next year. There are currently 700 bikes available for sharing under the current program, which is based in San Francisco, the Peninsula and the South Bay, but under a proposal backed by several different city leaders, the program could increase tenfold, to 7,000 by 2016. San Francisco and San Jose would see significant increases in the number of bikes available to use, and the network would be implemented in the East Bay for the first time, under the proposal. The plan does have some drawbacks for the Peninsula, however. 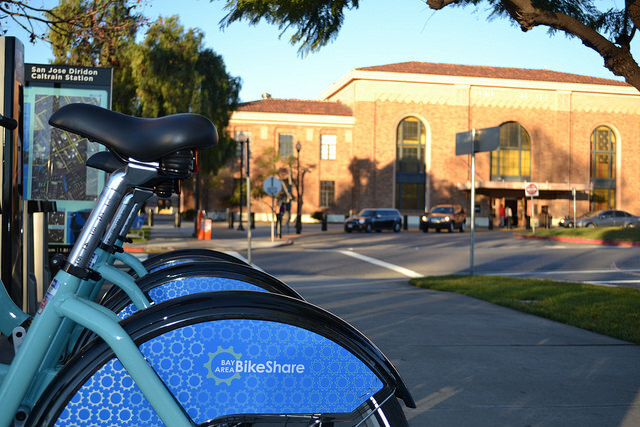 Under the initiative, bike-sharing programs in Redwood City, Palo Alto and Mountain View would be discontinued, due to low ridership. Big changes coming to Muni: Muni will implement its bigger service enhancements in decades starting on April 25. San Francisco’s transit agency will add more service to its most heavily-used lines, redesign its station map to include new information about scheduling, rename some bus routes and add bike racks to its bus shelters. The changes, part of a program called Muni Forward, are the first in a series of incremental steps designed to improve transit service in San Francisco. For now, the changes will focus strictly on bus routes, particularly Muni’s heavy-use “Limited” lines, which will be rebranded as “Rapid” lines as a result of the service shakeup. Muni officials said the service changes are the biggest since Market Street was renovated in the 1970s to include underground light-rail service. Northern California Cherry Blossom Festival is this weekend: More than 200,000 people are expected to attend the 48th annual Northern California Cherry Blossom Festival in San Francisco’s Japantown neighborhood this weekend. The free event, held on April 11 and 12 and then again on April 18 and 19, will feature food booths, cultural performances, martial arts and live bands. The second-biggest celebration of Japanese culture in the country, outside of Washington D.C., the Cherry Blossom festival is located conveniently next to several Muni bus routes, including the 38-Geary.